Subjective visual experience has been described previously in patients undergoing intraocular surgery, and may occur during either topical anaesthesia or regional anaesthesia (peribulbar, retrobulbar, subtenons).1–7 Published reports suggest most or all patients undergoing cataract extraction under local anaesthesia will report some visual symptoms when questioned immediately after their procedures. These symptoms are common therefore and range from perception of light, photopsia, colours, and movement, through to more formed visual sensations such as patterns, instruments, and surgeon’s fingers/hands/detail. It is not surprising that patients undergoing vitreoretinal surgery under local anaesthesia might also experience visual symptoms. We present illustrations and comments (figs 1–4) made by an artist who underwent retinal detachment surgery. He presented with macula-on retinal detachment successfully repaired by vitrectomy, cryotherapy, and 20% SF6 gas performed by peribulbar anaesthesia. They provide an interesting insight into previously unreported visual experience during vitreoretinal surgery. As visual symptoms are both common, and may be perceived to be frightening in a small percentage of patients,2 we reinforce the view that informed patient consent procedures should include the possibility of visual experience during vitreoretinal surgery under local anaesthesia. (A) “Now we are going to shine a very bright light light into your eye” ... and indeed it was bright. The light pulsated gently and sparkled at the edges where the heavenly blue began. (B) It was outshone by an even brighter light ... more pulsations and shimmerings of an intense whiteness followed and two glowing red circles appeared, the lower one seeming to be a secondary image or reflection of the upper one. (A) From time to time liquid was splashed on to the eye, producing quite remarkable starbursts of bubbles and comet trails of light. (B) The brilliant light faded and was replaced by deliquescent magenta coloured shapes, glowing like neon, constantly forming and reforming and with sparks coruscating round the edges ... a real firework display. (C) Quite suddenly the fireworks gave way to this darker mood ... the shapes still forming and reforming but more slowly, no longer glowing, but in a complementary colour to that of the previous image ... a muted lime yellow. (D) Next came perhaps the most extraordinary and delightful of all the images ... this near perfect facsimile of a Chinese silk painting of bamboos gently swaying, as if in a slight breeze, in front of a full moon. (E) Alas, the “Chinese painting” gave way to the appearance of “long whiskers”—rather like huge stray eyelashes—moving slowly but sometimes jerkily, at the top right of the field of vision. (F) Darker than this, richly beautiful and gently blurred, this next image somehow resembled a shallow stream. Clear water rippled over sunlit pebbles and water plants, long streamers of which gently swayed in the movement of the water. Sunlight flickered gently over everything—in many ways, a surprisingly realistic image. (G) This very powerful yet momentary image occurred towards the end of the operation. The incandescent green cross burned powerfully like an electric filament ... an inspection light perhaps? (A) After an initial period of impenetrable “fog”, the gas bubble gradually receded so as to allow me to see over the top of it. In these illustrations the bubble has receded to roughly halfway down the field of vision and I am lying on my left hand side with both eyes closed. The room is only semi-darkened. The pink light is very beautiful and emanates from a tiny convexity in the upper edge of the gas bubble. (B) The room is in complete darkness. The display is even more beautiful. Now it is a tiny concavity in the upper surface of the bubble that allows the violet “flare” of light to emerge. (A) Considerable time has now elapsed and the gas bubble has diminished a great deal. This is my view of it with the eye closed and in strong sunlight. (B) This illustrates still further diminution of the bubble and its detachment from the edge of the field of vision. (C) Eventually the gas bubble became miniscule, and reversed its position in the visual field of vision before disappearing altogether. Prasad N, Kumar CM, Patil BB, et al. Subjective visual experience during phacoemulsification cataract surgery under sub-Tenon’s block. Eye 2003;17:407–9. Au Eong KG, Low CH, Heng WJ, et al. Subjective visual experience during phacoemulsification and intraocular lens implantation under topical anesthesia. 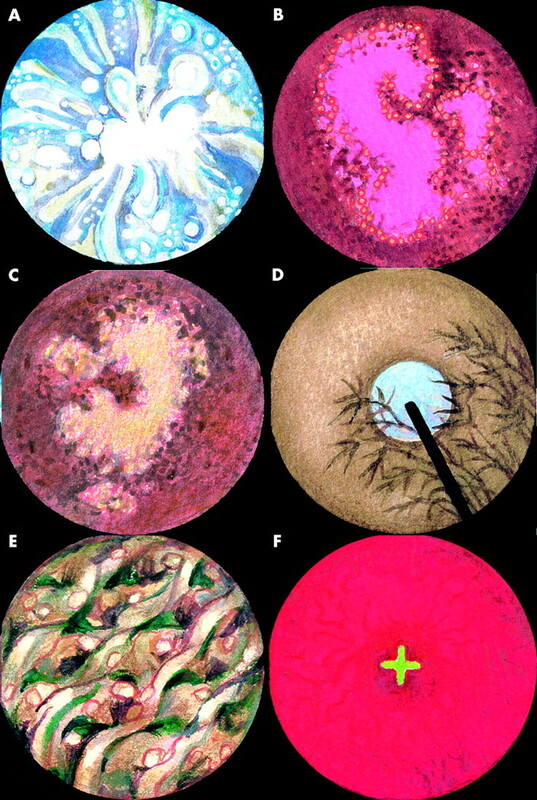 Ophthalmology 2000;107:248–50. Au Eong KG, Lee HM, Lim AT, et al. Subjective visual experience during extracapsular cataract extraction and intraocular lens implantation under retrobulbar anaesthesia. Eye 1999;13:325–8. Au Eong KG, Lim TH, Lee HM, et al. Subjective visual experience during phacoemulsification and intraocular lens implantation using retrobulbar anesthesia. J Cataract Refract Surg 2000;26:842–6. Newman DK. Visual experience during phacoemulsification cataract surgery under topical anaesthesia. Br J Ophthalmol 2000;84:13–15. Tranos PG, Wickremasinghe SS, Sinclair N, et al. Visual perception during phacoemulsification cataract surgery under topical and regional anaesthesia. Acta Ophthalmol Scand 2003;81:118–22. Murdoch IE, Sze P. Visual experience during cataract surgery. Eye 1994;8:666–7. Disclaimer: the authors have no financial interest in this manuscript.